Beef whole cover (about 2,5 kg.). White onion Half green celery. Salvia Rosmarino 10 bay leaves salt pepper extra virgin olive oil and butter. Tie the cover, larding it with Sage and Rosemary, season with spices, cover with wine in a container and rest in a cool place for 24 hours. Lightly sauté the vegetables in olive oil and butter, pour the cover with his wine and all the herbs and spices, turn up the heat until the alcohol evaporates, turn and continue cooking over very slowly (about 4 hours) by turning the meat occasionally, keep the pan covered. When stinging the meat is soft, remove from pot and lasciareproseguire the sauceup to thicken it, outdoor pot. Go to vegetable mill or with a whisk the sauce after removing the hard parts (Bay leaves, cinnamon, cloves). At time of service, warm the meat cut in a bit of sauce. 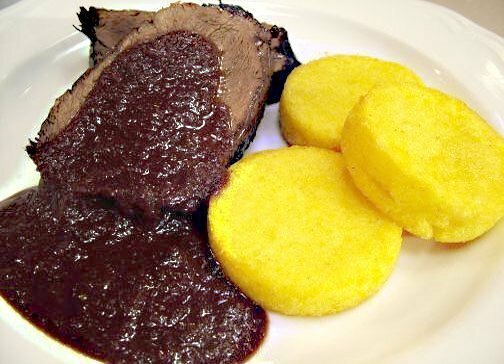 Heat the rest of the sauce separately so you can cover plenty of meat served with fresh polenta. It is a new dish, was created by the Association restaurateurs and is promoted as a typical dish. The Amarone chosen as cooking wine makes it different the end result of the dish, once simply used Valpolicella wine. The texture and richness of Amarone give a result of spice and velvet to the unique sauce in the panorama of stews made with wine preparing almost everywhere.